Affectionately tagged as Asia’s favourite playground, Sentosa Island is loaded with exciting attractions, golden beaches, luxurious resorts, fantastic theme parks and a beautiful marina. From indoor sky diving to fear inducing roller coaster rides, from musical extravaganzas to incredible firework, Sentosa Island is Singapore’s wonderland. Hop on a ferry, cable car or the Sentosa Express monorail to reach this wonderland and discover a whole new world of fun and thrills! From Asia’s tallest observatory tower (Tiger Sky Tower) to the amazing underwater world, Sentosa Island offers the best of both world attractions. 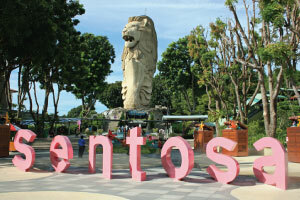 The top attractions at Sentosa Island can be divided into four segments. 1. Gogreen Cycle & Island Explorer – Rent an eco-friendly pedal-assisted bicycle and explore the island of Sentosa at your own pace. Prices start from SGD 28 for an hour. 2. Gogreen Segway Eco Adventure – Enjoy a thrilling ride of Segway with option of Segway Fun Ride (a specific circuit full of twists and turns – prices start from SGD 12 for one round) and Segway Eco Adventure (scenic ride along the Siloso or Palawan beach – prices start from SGD 38 for 30mins). 3. AZZURA Beach Club - Home to Sentosa’s first nightclub (the Harem), it is one of the most popular party hub in Singapore. The multi-level entertainment, dining and hydro-sports complex pumps out music till the wee hours of the morning. 4. Animal & Bird Encounters – Head to the Palawan Amphitheatre and witness an awesome animal and bird show performed by reptiles, parrots and monkeys! Enjoy a free admission but do check the show timings on the Sentosa website. 5. iFly Singapore – Get thrilled at one of the world’s largest themed wind tunnel for indoor skydiving. Prices start from SGD 99 per person. 6. Mambo Beach Club – It is considered as the perfect upscale beachfront destination to spend time with family and friends. 7. MegaZip Adventure Park – It offers one of the most extreme zip wires in Asia with a free-fall simulator. Over 450 metres long and at 72 metres above sea level, this flying fox adventure ride lets you whizz over the jungle canopy and the buzz of Siloso Beach. Prices start from SGD 19 per person. 8. Port of Lost Wonder – Being the Singapore’s first kid’s club by the beach, this attraction features themed islets for leisure activities and picnic, a signature water play area and good number of retail and dining outlets. 9. SeaBreeze Water – Sports@Wave House – It is a one stop shop for all the water sports activities like JetPack flights, Banana boat rides, Stand-up paddle boats, kayaking and much more. 10. Skyline Luge Sentosa – It is a combo of two rides: the thrilling Luge ride along the 1.4 km of trail and the Skyride which offers a scenic bird’s eye view of Sentosa Island, Singapore skyline and South China Sea. Prices start from SGD 15 per person for 1 Luge and 1 Skyride. 11. Flying Trapeze – As the name goes, Flying Trapeze is an excellent form of sport through which you can soar high above the beach and have the once-in-a-lifetime experience. Prices start from SGD 10 per swing. 12. Wave House Sentosa – Experience the ultimate Californian beach lifestyle and enjoy the multiple wave rides with family and friends. It is also loaded with excellent cafes, eateries, clubs and bars so you can party till late. 1. Fort Siloso: It is the only preserved coastal fort which stands as a witness to one of the most violent chapters in Singapore’s history. Along with featuring interactive exhibits, it is home to Singapore’s largest collection of World War II memorabilia. 2. Combat Skirmish Live: Get the Combat Laser Shooting experience in four different arenas like Indoor maze (SGD 20 for 20mins), Tunnel Battle (SGD 35 for 30mins), Laser Clay Shooting (SGD 35 for 30mins) and Mad Rush (SGD 40 for 60mins). 3. Underwater World Singapore & Dolphin Lagoon: Enjoy the close encounters with the marine animals at Underwater World Singapore. Additionally, meet the adorable fur seals as they perform alongside pink dolphins. 1. The Butterfly Park & Insect Kingdom: Encounter a great variety of fluttering butterflies and exotic insects in a lush tropical greenery. Prices start from SGD 16 per adult and SGD 10 per child. 2. Images of Singapore LIVE: Through a mix of live actors and special effects, know the history of Singapore and the journey of this nation since then. Prices start from SGD 15 per adult and SGD 10 per child. 3. Madame Tussauds Singapore: The only wax museum of Singapore, get to pose with your favourite A-List stars, politicians, sports stars, music legends, Bollywood and Hollywood personalities. Prices start from SGD 30 per adult and SGD 20 per child. 4. Sentosa 4D AdventureLand: This attraction consists of multiple 4-D movies which are a must-do for kids and adults. Prices start from SGD 38.90 per adult and SGD 26.90 per child for One-day adventure pass providing unlimited entries to 4D movies and games. 5. Sentosa Merlion: Get the most stunning views of the Singapore skyline from the top of a 37 metre-tall mythical creature of the city – the legendary Merlion. It is a half lion half fish guardian of prosperity which personifies Singapore’s history as a port city. Prices start from SGD 12 per adult and SGD 9 per child. 6. Sentosa Nature Discovery: Step out into the jungle and explore a wilderness teeming with insects, birds and multiple other wildlife and plants all at the Sentosa Nature Discovery. 7. Singapore Cable Car: This is one of the best options to reach Sentosa from Mount Faber located in the city hub. Get the best views of Singapore skyline and Sentosa Island in this cable car. Prices start from SGD 29 per adult and SGD 18 per child. 8. Tiger Sky Tower: Get aboard the Singapore’s tallest observatory tower which gently rises 131 metres above the sea level to provide you panaromic views across Sentosa and Singapore’s Southern Island – as well as neighbouring Malaysia and even Indonesia. Prices start from SGD 15 per adult and SGD 10 per child. 1. Adventure Cove Waterpark: A unique aquatic waterpark, this one features thrilling waterslides along with snorkelling option. One day Pass admission price starts from SGD 36 per adult and SGD 26 per child. 2. Crane Dance: Witness the love story of the world’s largest pair of animatronic cranes in a multimedia spectacle of lights, sound, water jets and pyrotechnic effects. This attraction can be enjoyed for free. 3. Dolphin Island: Get an opportunity to interact and learn about the Indo-Pacific Bottlenose dolphins through interactive programmes. Prices start from SGD 198 per person. 4. Lake of Dreams: This free entertainment show is all about flaming dragons, special laser effects and water cannons creating an excellent show that you will surely remember for a lifetime! 5. Marine Life Park: Featuring two marine wonders: S.E.A Aquarium and Dolphin Island, this will surely engage you and your kids for good 2 to 3 hours. One day Pass admission price starts from SGD 38 per adult and SGD 28 per child. 6. Trick Eye Museum Singapore: Globally recognised for its art technique in transforming 2D paintings and sculptures into 3D optical illusion, it is a must visit with family, friends and loved ones. Prices start from SGD 25 per adult and SGD 20 per child. Most travellers don’t need to a reason to visit this adventure island, however, if you are confused, here are the top reasons why you should visit Sentosa Island during your next visit to Singapore. Covering a big slice of the Sentosa Island is the integrated resort – Resorts World Sentosa. RWS is home to some of the top attractions of Singapore like the Universal Studios, Adventure Cove Waterpark, S.E.A Aquarium, Trick Eye Museum, Dolphin Island along with multiple hotels, restaurants, food courts, shops and casinos. Being one of the top rated attractions in Singapore, the Universal Studios is an excellent gateway for families, couples, animated movie lovers and adventure seekers. With loads of themed areas, attractions, thrilling rides, shows, eateries – this theme park is fun-packed and a value for money attraction. Did you know that Singapore features one of the finest skylines in Asia? So, do visit Sentosa to witness some awesome panoramic views of the Singapore skyline, especially the business district and harbour area. The ideal vantage point that offers a 360-degree view of Singapore city is the Sentosa Merlion. Another great option is the Tiger Sky Tower. If you want to add a little more excitement to your trip to Sentosa Island, consider viewing the famous skyline as you travel on Singapore’s Cable Car ride from Mount Faber to Sentosa Island. Just a few minutes away from the downtown region of Singapore, Sentosa Island features an excellent shoreline. There are three beaches on Sentosa Island’s 3.2 km long shoreline namely Palawan, Tanjong and Siloso. Each one is different and attracts unique segment of travellers. For instance, Tanjong is one of the most romantic beaches in Singapore and is perfect for couples and honeymooners. Palawan attracts more of family crowd while Siloso is known for its hot beach volleyball action and beach parties. 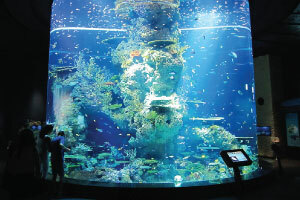 Visit the Marine Life Park on Sentosa Island to discover the world’s largest oceanarium – S.E.A Aquarium. Get ready to stand in awe at the wide collection of over 1,00,000 marine animals including rays, sharks and giant groupers. 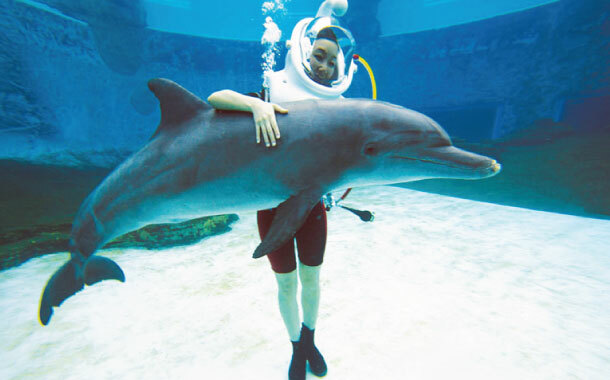 You can also visit the Dolphin Park to meet the beautiful bottlenose dolphins and even the pink dolphins. You also have the option of dining with the fishes at the unusual Ocean Restaurant. If this is not enough, enter the Adventure Cove Waterpark where you can sail down the peaceful Adventure River or zoom down the fast paced waterslides. So, wait not! Book your flight to Singapore and discover the all new world of Sentosa Island where fun never ends!